This edition of the poetic works of Emily Dickinson adds computer-generated imagery and computational misinterpretations and visualizations to the long chain of modification that constitutes the work of Emily Dickinson. Fewer than a dozen of her poems were published during her lifetime. After Dickinson's passing, her poems were heavily edited before publication by her acquaintances Thomas Wentworth Higginson and Mabel Loomis in 1890. For a century, this modified text was the primary versions of Dickinson's poems in broad public distribution. Upon entering the public domain, the 1890 edition was typed in by volunteers at Project Gutenberg and published online in ISO-8859-1 format on May 3, 2004. 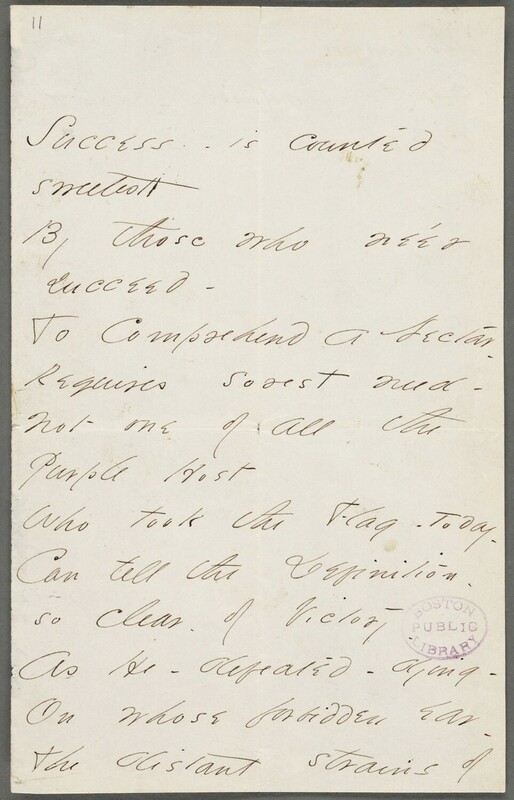 In 2013, Harvard University published the Emily Dickinson Archive (edickinson.org), a collection of high resolution images of Dickinson's manuscripts, licensed under a Creative Commons license. For the first time, members of the public without access to scholarly print editions can read Dickinson's poems as she wrote them. This text, based on the Project Gutenberg edition of Emily Dickinson's work, applies natural language processing software to the text, creating a visual display of the parts of speech used in each poem. Emily Dickinson's manuscript for the poem often called "success"
And I tip -- drunken. An Indiaman -- an Earl? Until to-morrow, -- happy letter! To -- no one that you know! "The sleet than May -- no thee!" That mushroom, -- it is him. And then -- the wharf is still.